Science Networking Program (SNP) has been organizing a seminar series since 2015, to inspire University of Tokyo students by inviting internationally renowned scientists. This academic year, we are holding three seminars, two of which were held in October and November 2017. The third seminar will be held on 14th February 2018, focusing on how to develop the successful career internationally by utilizing overseas research/study experiences. 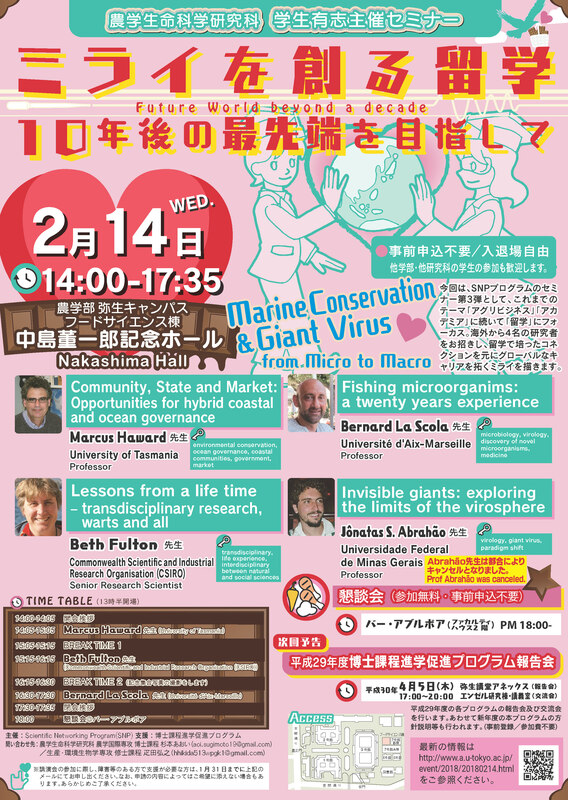 This time invited talks will cover wide range of fascinating topics such as marine environment governance, giant virus exploration, and transdisciplinary research. We are confident that the seminar will be beneficial to all students, regardless of whether they are planning to be engaged in academics, industries or government sectors in future. with the speakers and other students/researchers!